Windows task manager can be used to rescue computer when it hangs (and specific program does not respond). You can kill or close any unresponsive application program / task from the task manager window. Further, to fully recover from unresponsive build up you need to restart the computer. 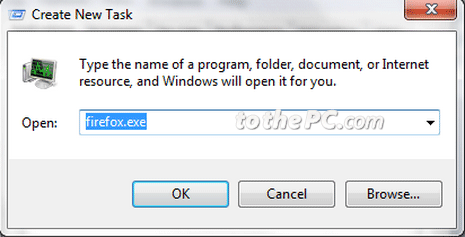 However, if you do have time to restart the computer – you can easily launch application programs from task manager and get going with your work. 3. Click on Browse and select the application that you want to start or type the application name. For example: if you want to run firefox then type firefox.exe in the command line. 4. Click OK & the application will start on your Windows computer. Similarly, you can open more applications on Windows computer using above routine.